Today's bento was pretty simple, it didn't take too long to prepare. I mentioned before about B.O.M.B's Green Baran Challenge for this month organized by Debra from Hapa Bento. So, my 'green' baran for today was steamed broccoli with carrot flowers on the top. 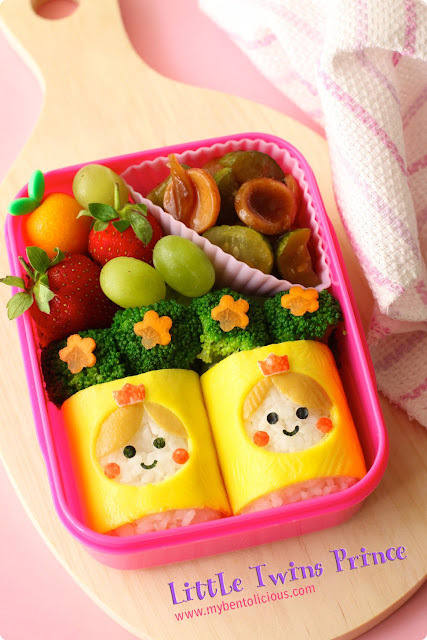 The little twins princes were made of rice and decorated with the egg sheet, red part of crab stick and nori. Inside was stuffed with pork mince. On the top section are fruits (strawberries, kumquat, grapes) and cucumber & pork sausages in pink silicone food cup. I've got the new food picks last week and posted the picture on my Twitter. As a 'bento addict' I don't know when I will able to stop collecting all bento stuffs. No regret though because I'm really enjoying it. the prince are adorable. must have missed your twitter post - where did u get your stuff? Thank you for bringing more sunshine to my day with your sweet bento, Lia! 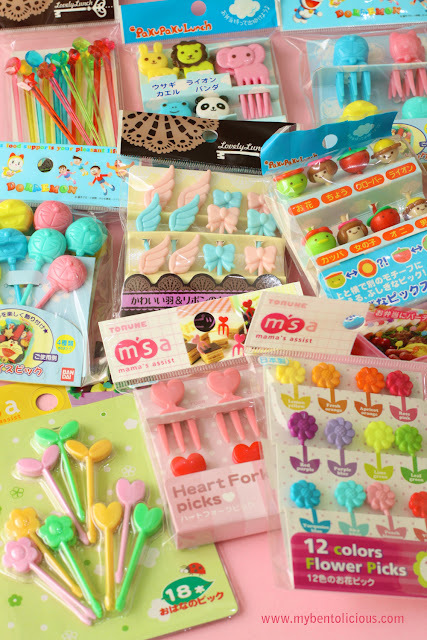 @shoppingmum : Amy, I was asking friends favor who live in Japan and Taiwan to buy and send me the food picks. The twins prince are so adorable. may i put your site on my link? @kawaii : Sure you can put my link on your site ... thanks a lot! Very appreciate it. It's kind of hard to find bento stuffs in Indonesia but I am so lucky to have friends that so kind to help me out. Do you make bento too? What is the address of your site? @The Bargowo : Nitip temen Mbak! Hayo dibikin 'ngiler' semua hahaha ... :D Thanks yah! BTW, kok ng bisa comment di blognya yah? wonderful little princes lia! i love the idea of wrapping the rice with a cut-out. those teeny-tiny broccoli florets are a great green baran, too, and i can't wait to see how you use all these fab new picks! The Little Twins are so cute and I love your new collection of picks! Argggghhhhh Lia, I have another case of bento envy!! Love your bentos! So cute. May I ask what type of punch you use for the eyes and mouth. I have several punches, but they seem so big. The eyes and mouth look out of proportion to the onigiri. :-) Thank you for sharing. Adorable little princes! You did a great job with your green baran! @arkonite_babe : hahaha ... Thanks a lot Arkonite! @96753girl : Thanks for your comment! For this bento, I was using green shoe puncher and free mini puncher from my quail egg cutter set. I am so envy with your new stock of picks!! Oh what cuties!! Their hairs are cute in particular. @Xiao Yen Recipes : Thanks a lot for nice comment!